Depending on the source, revenue may be associated with certain conditions that can restrict how it is spent. As registered charities, MRIs attract substantial philanthropy into the sector. This extra stream of funding is a vital component of MRIs’ revenue as it provides additional (often more discretionary) funding, for example, for blue-sky research projects that are often not successful in obtaining funding from government grant schemes. MRIs also attract commercial income which can then be used to support research. 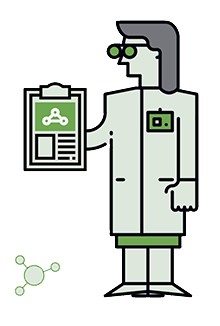 Commercial income is generated by MRIs through collaboration with industry on research projects, income from commercialisation their research intellectual property (IP) and a small amount through other activities such as fee-for-service research or clinical facilities. As MRIs are charities, all commercial income is directed back into the institutes to support health and medical research. Independent MRI revenue increased by 17% in two years. This is four times the growth compared to the previous two years. Nearly 60% of MRI revenue is from non-government sources. Over 70% of non-government revenue for iMRIs was from three major sources: fundraising & philanthropy, commercial income and non-government competitive research grants. The largest increases in independent MRI (iMRI) revenue were from commercial and philanthropic sources. 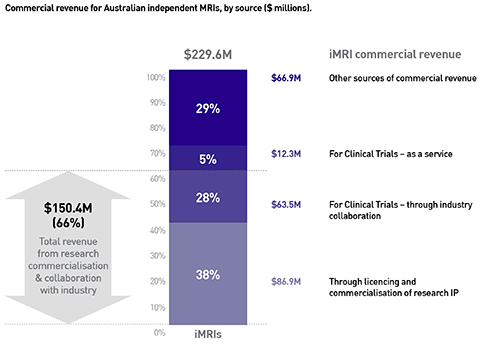 The majority of independent MRI commercial revenue is from collaboration with industry and commercialising research discoveries. MRIs success rate for NHMRC Project Grants was 6% above the national success rate in both 2016 and 2017. 46% of NHMRC competitive funding went to MRIs (38% went to independent MRIs).